Duotech provides complete nose-to-tail support for the F-16 Fighting Falcon. 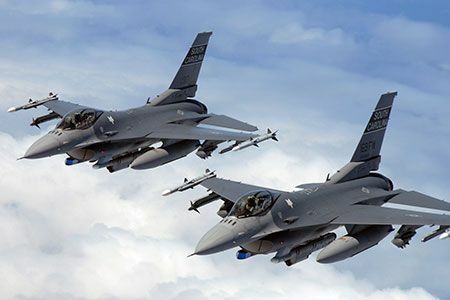 Determined to provide the highest quality repair and engineering services for your F-16, Duotech accomplishes this at lower cost and shorter turn around times than the OEMs. We provide affordable, effective support alternatives that help our customers avoid scrapping mission-critical equipment like the APG-66 and APG-68 fire control radar, flight control systems, and other essential aircraft electronics. Our customers around the globe receive world-class support with customized solutions tailored to their specific needs. Duotech is AS9100D certified and is an Air Force qualified repair depot. Learn more about Duotech’s long-term sustainment capabilities for your F-16 Fighting Falcon.